The Ukrainian aviation industry at the time of the USSR was a subject of pride of this federal republic. Still! The planes developed by design office of Antonov and made on aircraft factories of Kiev and Kharkov, were famous for the reliability and at times on the head surpassed in the characteristics the best world samples. It is enough to remember risen in the sky in 1947 and An-2 flying until now, and also still unsurpassed on loading capacity of An-225 of "Mry", created for transportation of the Soviet space shuttle "Snow-storm". But to all the end comes. Including the Ukrainian aviation industry. As well as any hi-tech production, the Ukrainian aviation industry it was connected by thousand cooperation threads with suppliers across all Soviet Union. Their gap which has followed after 1991 was reflected in wellbeing of branch at all in the best way. Naive dreams of the future prosperity in conditions when «it is not necessary to feed Moscow», broke about severe reality. To live without «Russia eating round Ukraine» it appeared not so simply: the Ukrainian planes of very few people interested in the conditions of the rigid competition to the American and European aviagiants, and to refuse production of the Russian suppliers it was impossible under no circumstances. Attempt to be switched from the Russian partners on the West European turned out a complete fiasco. The Airbas concern which has exposed as a condition for coproduction of the transport worker A-400 providing of technical documentation on the latest development of the Aviation Antonov scientific and technical complex, received demanded and cooperation froze. And soon the transport vessels which are amazingly reminding on a silhouette an antonovsky prototype began to descend from its building berths. The advertized cooperation with Americans in delivery of planes-toplivozapravshchikov for the U.S. Air Force turned back full fiasco: the tender demand of the Ukrainian party was rejected as out of time submitted, and the tender won, certainly, "Boeing". And the basic approach to the Ukrainian aviation industry was sounded by Nikolay Azarov holding at that time a post of the prime minister of Ukraine: «At me the meeting with the French management and the Airbus aircraft company management took place, and they to me told that your plane (An-70) is better than ours, but we will make everything that your plane did not find a sales market». Thus the Ukrainian aircraft manufacturers did not leave hope on an old national habit «not to blot, having slipped between droplets»: and on the West to be reoriented to annoy «klyaty Russians», and to use the Russian possibilities to make «the Ukrainian national product». In due time, speaking at meeting of the Inter-parliamentary commission on questions of cooperation of the Verkhovna Rada of Ukraine and Federal Meeting of the Russian Federation, the head of Antonov Group Dmitry Kiva presented production of the enterprise. He especially noted that in its number there is no project the share of Russia in which would make less than 50 %. So, 126 enterprises of Russia on which over 60 % of accessories of the plane are made take part in production of one of the most "untwisted" planes of the An-148 enterprise. And the share of the Russian production in final cost of An-140 on which creation 100 Russian plants work, reaches 70 %. Attempts to be switched to western "partners" led to very pitiable consequences for the Ukrainian aircraft industry. During one of meetings with the ambassador of the Russian Federation in Ukraine Mikhail Zurabov the author could hear the detailed story about problems with performance by the Ukrainian party of these promises on deliveries to Russia of An-70 planes therefore Russia reduced in the beginning the order for these planes, and then was compelled to refuse completely joint production An-70 with Ukraine. Instead of it Russia had to buy Il-476. Though Ukraine also declared readiness to make An-70 independently, it appeared prozhekty as Russia financed the project for 72 %, and Ukraine should enclose 28 %, but the obligations did not execute. Also because of a nepodjyomnost for ANTK "Antonov" of a problem of production of the Ruslan An-124 plane for the Ministry of Defence of the Russian Federation the order left to Ulyanovsk "Aviastar joint venture", and plans on development of transport An-140 in the military version were corrected and instead of it in armies will arrive Il-112 of own development. The chance to keep a unique scientific and technical complex appeared after the conclusion Victor Yanukovych and Vladimir Putin of the Kharkov agreements within which not only продлялись terms of basing of the Black Sea fleet in the Crimea and the discount for the Russian gas made a reservation, but also a number of arrangements on cooperation between Russia and Ukraine on a large number of the directions was reached. Including in the aircraft manufacturing branch, concerning coproduction of "antonovsky" planes. But the neo-Nazi revolution made in Kiev in February, 2014 with support of the USA and the European Union, gave up as a bad job prospects of coproduction of planes of the An brand for needs of Russia and the third countries. Literally from first days after a coup d’etat the Kiev authorities declared a course on curtailment of cooperation with Russia in all branches. And first of all highly technological, including defensive production or that can be used for the Russian armed forces. Soon after that the order of head of SBU of Valentin Nalivaychenko all confidential documentation on production used in production of military equipment and equipment of a dual purpose, was transferred to the American intelligence services. And afterwards a number of the acts limiting military and technical and scientific and technical cooperation of Ukraine with Russia followed. Including denunciation of the relevant intergovernmental agreements. The authorities keeping on bayonets of neo-Nazi fighters, aspires to limit not simply cooperation with Russia, but also pursues heads of the enterprises which are carrying out this cooperation. So, in April, 2014 the general designer of ANTK of Antonov Dmitry Kiva whom the order of Ministry ousted was subjected to repressions, and the armed fighters tried to grasp force the enterprise. In five years before it already was exposed to attack of unknown just next day after signing of the important agreement for Ukraine with Russia in the field of aircraft industry. This time to clean «a hand of the Kremlin» in the Ukrainian aviation industry solved forged charges of waste of public funds. But final destruction of the Russian-Ukrainian cooperation in aircraft manufacturing branch occurred just one of these days. On September 8, 2015 at the disposal of the Cabinet of Ukraine No. 920 it was ordered «To the state aircraft manufacturing concern "Antonov" to take measures for providing an exit of concern from … JSC OAK-Antonov. 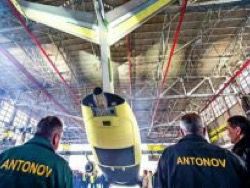 «The united aircraft company» is "Antonov’s" that Russian partner who on the basis of the Kharkov agreements provided financing of joint Russian-Ukrainian projects on creation and manufacturing of An planes. Generally, the situation which will develop after an exit of the Ukrainian state aviaconcern of the joint enterprise with Russia, is clear: fine development of aviation CB of Antonov with a rupture of cooperation communications with the Russian enterprises will make impossible production of new planes technically, and an exit of joint venture with "OAK" – financially. The last thread holding Ukraine in a cohort of aircraft manufacturing powers, is split today by the Ukrainian government. After the space branch destroyed by a rupture of communications with Russia, under a knife also the aircraft manufacturing now is started up. The liquidating commission by mistake called by Ministry of Ukraine, continues to destroy competitors of the American owners. There is the last question: what branch of the Ukrainian economy following in turn on destruction?